While choosing a destination for upcoming vacation sometimes it is so difficult to decide where do you want to go, what do you want to do and what do you want to see. And the task becomes even more complicated if your friends have a different point of view what the holiday is about or if being a good parent you want to make a vacation both fun and educative. The Andalusian climate offers more than 300 days of sunshine per year together with comfortable and moderate temperatures all around the year, allows to enjoy a very special and different lifestyle. Natural beauty and geographical diversity of the region: here you find the contrasts of sea and mountain, sun and snow, plains and mountains, etc. And your bonus is a possibility to visit and experience 10 UNESCO World Heritage Sites and to experience 3 items of Intangible Cultural Heritage of Andalusia. According to the UNESCO World Heritage Committee Spain has 45 sites in total occupying the second position next to Italy. And right to say Andalusia hosts 7 World Heritage sites inscribed on the list. Most of the cultural sites are located in cities that used to be the three great Muslim centres of power: Granada, Seville and Cordoba. Moreover UNESCO now has a list of Intangible Cultural Heritage of Humanity, which encompasses cultural traditions, practices and crafts. Andalucia has three cultural traditions inscribed in this list: flamenco, the Mediterranean diet; and the Cordoba Patios Festival. Flamenco and Mediterranean diet are quite known outside Andalusia but the festival of Cordovan Patios when private houses open up their patios to visitors is pretty unique. So if you want to experience something vivid and colourful do keep in mind a time when planning a visit. There are two options on making your plans it is either to be based in Marbella, which lies in between of everything, and making a day trips or to make a kind of a road trip travelling from one destination to another. But the most comfortable and hassle free way is to experience all this amazing sites with Marbella in-Style Private or Self-Drive Tours. We will ensure that your one day trip will run smoothly and turn into a colourful lifetime experience. The whole history of prosperous and lavish life of Moors in Iberian Peninsula starts in the city of Cordoba. It’s period of greatest glory began with the establishment of Cordoba Caliphate in the 8th century after the Moorish conquest, when some 300 mosques and innumerable palaces and public buildings were built to rival the splendours of Constantinople, Damascus and Baghdad. Due to that rivalry with the great capitals of oriental world we have a unique opportunity to enjoy today Cordoba’s historic center encompassing 80.28 ha, which is the most extensive historical heritage site in the world declared World Heritage Site by UNESCO in 1984. 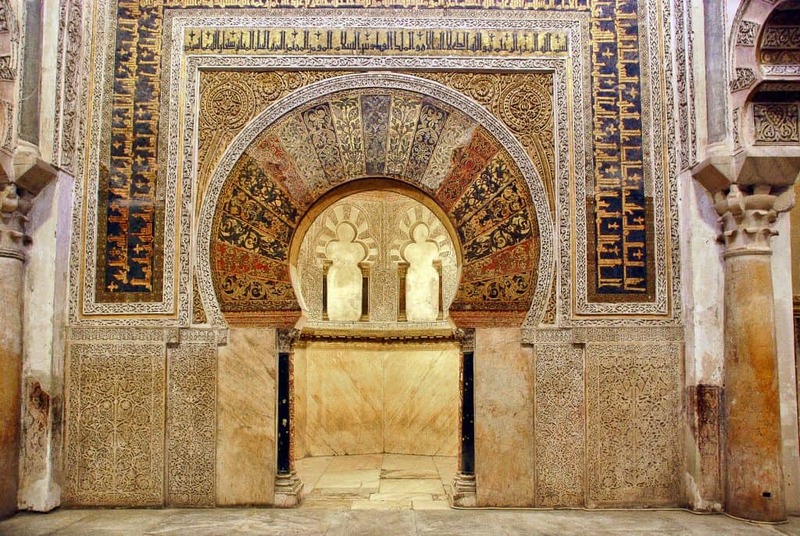 The most emblematic monument of that period is the Great Mosque of Cordoba represents a unique artistic achievement due to its size and the sheer boldness of the height of its ceilings. It is an irreplaceable testimony of the Caliphate of Cordoba and it is the most significant monument of Islamic religious architecture. It was the second biggest in surface area, after the Holy Mosque in Mecca and was a very unusual type of mosque that bears witness to the presence of Islam in the West. The Great Mosque of Cordoba was inscribed on the World Heritage List in 1984 and the property was extended in 1994 to include part of the Historic Centre, the Alcázar (the fortress), and extending south to the banks of the River Guadalquivir, the Roman Bridge and the Calahorra Tower. That same year the Jewish Quarter was inscribed on the list as well. Today the Judería de Córdoba is recognised as the second most known site of Córdoba and forms a part of the historic center of city which tells the story how the city lived a splendid period when three neighbourhoods Christian, Jewish and Muslim with their corresponding religions coexisted peacefully, offering the world an example of tolerance and intelligent civilisation. The Historic Centre of Cordoba creates the perfect urban landscape. It reflects thousands of years of occupation by different cultural groups – Roman, Visigoth, Islam, Judaism and Christian, that all left a mark. This area reflects the urban and architectural complexity reached during the Roman era and the splendour of the great Islamic city, which, between the 8th and the 10th centuries, represented the main urban and cultural focus in the western world. After the fall of Córdoba Caliphate a new prosperous Muslim Kingdom of Granada has appeared in the 13th century. 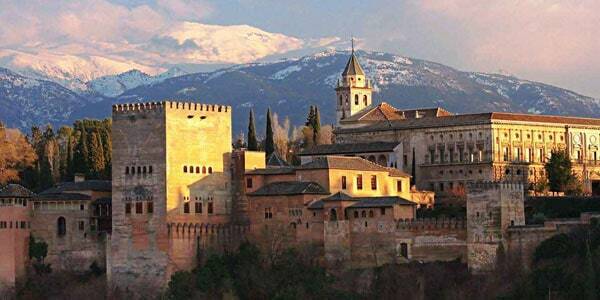 It was the last Moorish stronghold in Europe, the Alhambra reflects the splendour of Moorish civilisation in Andalusia and offers the best samples of ornamental architecture, spectacular and lush gardens, cascading and dripping water features, and breathtaking views of the city. According to the Koran, the holy book of Islam, it continually repeats the idea that heaven is a garden with running water. From this perspective we could say that the Alhambra is an Arabic attempt to create heaven on earth. And doubtlessly the Alhambra is Granada’s love letter to Moorish culture and a great lesson in medieval architecture. Originally The Alhambra was a palace, citadel, fortress, and the home of the Nasrid sultans, high government officials, servants of the court and elite soldiers from the 13th to the 14th century. Other notable buildings belonging to a different time period are also located within the Alhambra complex, most notably the Renaissance style Palace of Charles V.
Believe it or not but there were dark times in the history of this jewel. During the Napoleonic occupation, the Alhambra was used as a barracks and a huge part of the monument was damaged or destroyed. What we admire today has been respectfully restored and we have to be thankful to an american writer Washington Irving who has evoked a public´s interest to this historic monument by his book Tales of Alhambra. Today the Alhambra is the most visited monument in Spain and the Nasrid Palaces are the Alhambra’s true gem, annual number of visitors reaches up to 7 million. We may definitely say that it is the most brilliant Islamic building in Europe, with its perfectly proportioned rooms and courtyards, intricately moulded stucco walls, beautiful tiling, fine carved wooden ceilings and elaborate stalactite-like muqarnas vaulting, all worked in mesmerising, symbolic, geometrical patterns. The Albaycín district is situated on a hill above the center of Granada and across from the Alhambra. It was an ancient Muslim neighbourhood which is very popular with visitors today – and rightly so. Today part of a UNESCO World Heritage site, since 1984, Albayzín dates back to the 14th century and was built as a defensive town and thrived as one of the centres of Granada under Muslim rule. Among its narrow, winding streets one will find beautiful white-washed old buildings, splendid Arabic shops and restaurants, scenic gardens, and marvellous views of Granada and the Alhambra. The pace of history and culture on Iberian Peninsular forms a stunning Golden Triangle of Moorish Empire presented by the Alhambra of Granada, the Mezquita of Cordoba and the Royal Alcazars of Sevilla, these UNESCO listed sites constantly remind us of the 3 cultures which have lived here (Arab, Christian and Jewish) and which together have created the unique character of the Andalusians. 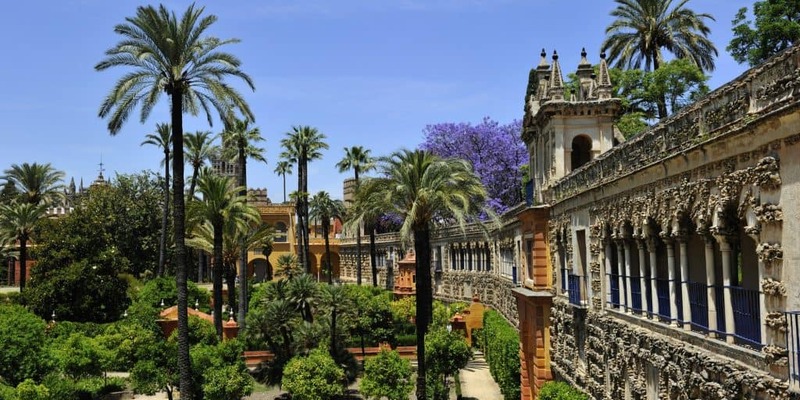 The Old Town of Seville, the third largest in Europe with an area of 4 square kilometres, it contains three UNESCO World Heritage Sites, listed in 1987: the Alcázar palace complex, the Cathedral and the General Archive of the Indies. They perfectly epitomise the Spanish “Golden Age”, incorporating vestiges of Islamic culture, centuries of ecclesiastical power, royal sovereignty and the trading power that Spain acquired through its colonies in the New World. The Royal Alcazars of Seville is a royal palace recognised as one of the most outstanding examples of mudéjar architecture found on the Iberian Peninsula. The original nucleus of the Alcázar was constructed in the 10th century as the palace of the Moslem governor, that makes it even older that the Alhambra. The palace is used even today as the Spanish royal family’s residence in this city, thereby retaining the same purpose for which it was originally intended: as a residence of monarchs and heads of state. Built and rebuilt from the early Middle Ages right up to our times, it consists of a group of palatial buildings and extensive gardens. It is the oldest royal palace still in use in Europe. The Alcázar complex embraces a rare compendium of cultures where areas of the original Almohad palace – such as the “Patio del Yeso” or the “Jardines del Crucero” – coexist with the Palacio de Pedro I representing Spanish Mudejar art, together with other constructions displaying every cultural style from the Renaissance to the Neoclassical. The next UNESCO site is the Cathedral. It was founded in 1403 on the site of a former mosque, it is built in Gothic and Renaissance style. It is the largest Gothic building in Europe and covers seven centuries of history. Ever since its creation, the Cathedral has continued to be used for religious purposes. The Giralda, the Cathedral’s bell tower, was the former minaret of the mosque, and now is important example of the cultural syncretism thanks to the top section of the tower, designed in the Renaissance period. And the last but not the least in among UNESCO sites in Seville is the Archivo de Indias building constructed in 16th century to house the Casa Lonja or Consulate of the merchants of Seville. It became the Archivo General de Indias in 1785, and since then it has become home to the greatest collection of documentation concerning the discovery of and relations with the New World. This modest and at the same time powerful building symbolises the link between the Old and the New World. Located at the heart of Andalusia in Antequera town, the site comprises three megalithic monuments: the Menga and Viera dolmens and the Tholos of El Romeral, and two natural monuments: La Peña de los Enamorados and El Torcal mountainous formations, which are landmarks within the property. Built during the Neolithic and Bronze Age out of large stone blocks, these monuments form chambers with lintelled roofs or false cupolas. These three tombs, buried beneath their original earth tumuli, are one of the most remarkable architectural works of European prehistory and one of the most important examples of European Megalithism. Doñana National Park in the province of Cadiz occupies the right bank of the Guadalquivir river at its estuary on the Atlantic Ocean. It is notable for the great diversity of its biotopes, especially lagoons, marshlands, fixed and mobile dunes, scrub woodland and maquis. It is home to five threatened bird species. It is one of the largest heronries in the Mediterranean region and is the wintering site for more than 500,000 water fowl each year. The urban morphology of the two small cities of Úbeda and Baeza in southern Spain dates back to the Moorish 9th century and to the Reconquista in the 13th century. An important development took place in the 16th century, when the cities were subject to renovation along the lines of the emerging Renaissance. This planning intervention was part of the introduction into Spain of new humanistic ideas from Italy, which went on to have a great influence on the architecture of Latin America. The central areas of Úbeda and Baeza constitute outstanding early examples of Renaissance civic architecture and urban planning in Spain in the early 16th century. Prehistoric Levantine rock art sites are found in the coastal and inland mountain ranges of the Mediterranean Basin of the Iberian Peninsula over 1,000 kilometres of coast, from Catalonia to Andalusia. The property includes 758 sites distributed across six Autonomous Communities, in Andalusia 68 separate cave paintings are to be found in Velez-Blanco and Maria in Almeria; Almaciles and Huescar in Granada; Quesada, Pontones and Santiago de la Espada in Jaen. The cave art constitutes an exceptional historical document due to its broad range and provides rare artistic and documentary evidence of the socio-economic realities of prehistory. It is exclusive to the Mediterranean basin of the Iberian Peninsula due to the complexity of the cultural processes in this region in later prehistory and factors related to conservation processes, such as the nature of the rock and specific environmental conditions as well as the range of subjects depicted and techniques employed. With this we have covered the main monuments listed by UNESCO but there are still a plenty of miracles to see in Andalusia.